I began my business back in 2004 with a keen interest in building computer systems, correcting hardware and software faults and supplying computer parts and accessories - from desktop systems and laptops to single ink cartridges. That same interest continues today; except I visit all my clients by bicycle, rather than confining myself to an office or shop. I have also provided web and print services - from designing and maintaining websites to printing and supplying business cards, leaflets and other stationary. 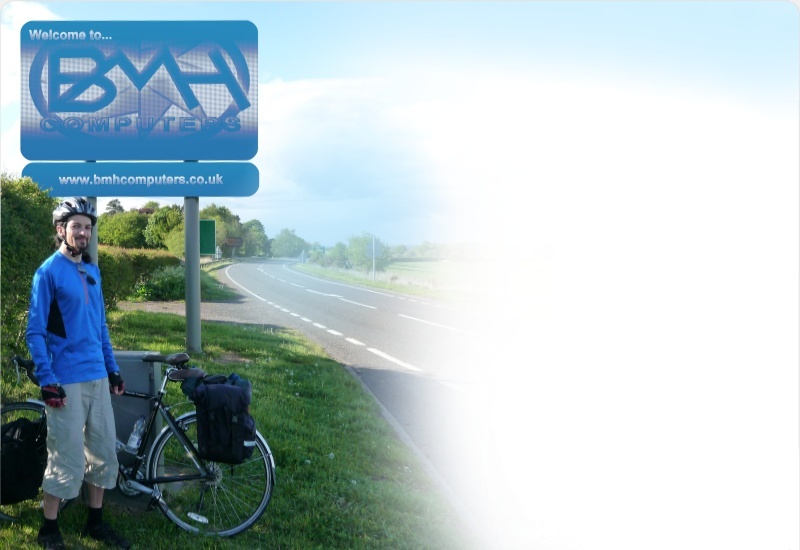 The service I provide is also unique to my ethical conscience - not only do I cycle all over Anglesey to visit my clients, come rain or shine, but I also try to avoid treating technology as a throw-away commodity. If I do need to supply something new or if something does need disposing of then I am keen to consider and promote greener options. Please check out the rest of the website or get in touch to find out more. BMH Computers is located on the Isle of Anglesey in the UK, generally the products and services provided are done so with local customers in mind. You are welcome to get in touch to discuss your requirements if you live further afield. .pdf: There are some documents throughout this website that are in .pdf format which requires Adobe Reader or other suitable reader to be installed on your computer - Adobe Reader is freely available from Adobe. If you would prefer a printed copy of any documents at this website then you are welcome to get in touch with your postal address and requirements. Cookies: BMH Computers does not itself deploy cookies (except into hot beverages). However, there is a tracking service at work throughout this website, provided by a third-party, that is used for simple monitoring of visitor numbers - this uses a cookie to provide this function - it does not store your IP address in the cookie. As with all websites, you can disable cookies in your browser settings if you really want to.